What can curators of contemporary art learn from the distributed and participatory systems of new media art? 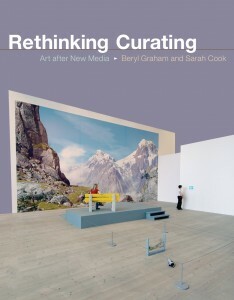 Sarah Cook and Beryl Graham, co-founders of CRUMB (The Curatorial Resource for Upstart Media Bliss, www.crumbweb.org), are the authors of the recent volume Rethinking Curating: Art After New Media (MIT Press). While in residence at SAW video in Ottawa, Sarah Cook took a pause from a flurry of activity to expand upon concepts evoked between the covers of the book and during her presentation at the National Gallery of Canada. As Nathaniel Stern observes in his review (http://rhizome.org/editorial/3617) of this collaborative work (authored with drafts exchanged via email and Wiki), the number of examples and citations provide a provocative constellation of possibilities. They argue that the connectivity of new media art challenges default modes of artistic authorship and curatorial operation and points towards new metaphors and modes of curating as a distributed activity. Artengine: If we use your metaphor of the art world as distributed network model, how can curators distribute their activities through that network and operate between the many contexts that exist within it? What means are available? Sarah Cook: There are two angles or entry points to this question for me: one is to look at open source methodologies, allowing someone else to take an idea and do it better; the other is about distributing your own curatorial practice to a group of people or to different nodes in the network, so that they each enact part of it. Attribution within open source software development is a really key feature of the field because every change to the code is annotated, footnoted, explained and authored and you can track back through all of that and find out why things were changed. That kind of attribution doesn’t exist in the curatorial world where knowledge has been more privatized or owned by the organization, the gallery, the catalogue, the curator who is writing the catalogue essay, or the artist who is making the work. An interesting example that has come up within the context of CRUMB is from the work of our PhD student Dominic Smith, and his use of attribution to build upon an existing artwork. He took an artwork initiated by Julian Priest and Adam Hyde that involved shredding proprietary software manuals and using the shredded manuals in a compost to then grow plants. 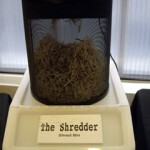 The original work was written out as an instruction and they had this nice event of shredding the manuals and making the compost, mixing it with coffee grounds, the idea being that software manuals and coffee are the two fuels for open source software development. Dominic Smith and his collaborators at the Polytechnic asked Julian if they could take his idea and, in an open source way, modify it and give it back, or fork it off to another project. Julian agreed – he didn’t really hold any IP over it in the way that you’d think an artist would. They modified the idea so that rather than mixing the manuals with coffee grounds they mixed them with a different material and grew mushrooms and used the mushrooms in Kate Rich’s Feral Trade Café (see the Shredder project page http://ptechnic.org/ecologies/shredder/index.html). So it was a similar process but with a different iteration, with the idea that the documentation could go back into a sort of art commons — the sharing of ideas in space. Do you see that iterative approach as related to the performance scores of conceptual art practices? I think performance is a really good analogy and always has been for new media practice in that you can look at it as instruction-based and you can look at iterations or versions of works. I think that aspect of iterative practice – the change that an artist introduces to an idea when they make it their own – is definitely related. You mentioned something about more collaborative modes of curating as a means of distributing curatorial work in the network – maybe you could talk about that in terms of distributing IP in a practical sense. This is something that Beryl has also been trying to get her head wrapped around, and when we talked with Maria Lind in New York a couple of weeks ago that’s one thing we asked her to talk about explicitly. She described working on a particular exhibition where she created what she called her “reference group” made up of other curators and artists who would be in the show, but would also be charged with developing new works and new commissions for the exhibition. When we queried Maria about that idea of collaboration, she said that she asked one of the artists if they’d like to co-curate with her and the artist said, “no, I’d rather do my work” and so to me that didn’t sound like collaboration (or distributed curatorial work). It sounded like conversation, but not really like collaboration. Beryl always tries to distinguish in her writing between collaboration as having a mutual affect on one another’s ideas and actions, as opposed to an interaction which might be more directed, something that might be more responsive, you know ‘push a button get a reaction’. Collaboration happens when you actually have such a mutual affect on each other that you swap roles, which would be the obvious way to see it (the artist becoming the curator, the curator becoming the artist). Of course there’s a lot of collaboration that you don’t really see because it’s not as obvious as swapping roles. It’s a very context-dependent activity. There was a part in Rethinking Curating where you talked about conversation and metaphors of curating as conversation as a reflection of power dynamics that occur in the network structure. Can you say more about that? I suspect you’re thinking of something that Beryl first wrote where she tried to make an analogy between curating and the political sphere. She uses a diagram called A Ladder of Citizen Participation (by Sherry Arnstein, from 1969) which indicates one’s engagement as a voter in a political context, showing that it is dependent upon the media, is dependent on whether you’re actually consulted or not, and whether you’re able to take an action that then affects what happens. Beryl has applied that idea in a contemporary art context to interactive art. In terms of curating, is there a way in which you could break down those roles, and think about how much power you are giving to your audience, or is the artist giving power to the audience, or is the artist facilitating a situation where the audience is giving power to each other to affect the work? It’s a bit difficult to talk about without getting down to a concrete example of an artwork, and I think it’s much harder to talk about when you’re looking at the context of curatorial practice. Beryl usually brings up Rafael Lozano-Hemmer’s work as a really interesting instance where he gives the power to the audience to interact with one another, rather than just with his system, so again it comes back to setting up a protocol that’s facilitating that interaction. I’d like to discuss something you mentioned in your talk at the National Gallery, about the way that art is getting flattened online, traveling through all these networks onto blogs and other online venues and becoming a representation of itself. Then there’s this question of what’s being curated, the object or the image? Art and information are becoming conflated, something that has happened in earlier art practices as well but it seems to be more pronounced now in the digital realm. I don’t know what to make of it either, and I’m not sure if it’s a generational thing or whether we’re all just so used to tagging our data ourselves now that we don’t actually expect anyone to keep a taxonomy for us. I wonder for younger generations if it even occurs to them that people sit around in committees and decide on taxonomies and subject headings and that there’s a reason why sometimes we all use the same one as opposed to using a folksonomy, which has become the default mode. I can’t figure out whether I’m being a stickler by thinking it’s a problem that people just circulate the image and tag it the way they want, as opposed to actually trying to standardize the way in which they describe something so that other people can better find it later. I guess what I was trying to point out in my talk at the NGC by showing the site that Oliver Laric and Guthrie Lonergan and others do (http://www.vvork.com/) is to point out how that kind of sharing of just the idea, regardless of its form, leads to a certain sense of tastemaking, that then can be realized in actual space with actual forms. I don’t know if it’s marketing, branding, or just tastemaking, but it seems like it makes sense to use these tools to flatten everything enough or as Régine Debatty would say to “vulgarize” everything enough so that you get to the point where people think you must have other ideas, you’ve shown you have this clear thread here and you’re interested in these things, what would you do if you had a space, or if I gave you a magazine to edit, or some other format where you would move beyond that flat screen level of selection to selecting in real space? This seems to be a discussion that’s happening a lot in curating, which could be tied to the fact that increasingly contemporary art curators are much more interested in the single artist/single curator interaction of commissioning and working with one artist to develop a project. Is that a retaliation against the fact that the group show has become dumbed down into this idea of well, anybody can put together a group show; you just get to pick all this stuff? On Michael Connor’s online radio podcast about contemporary art and new media art (Radiovisual) he interviewed Shaquille O’Neal because Shaquille was invited by a commercial contemporary art gallery to curate a show about ‘size’ since he’s so big. So they collected still images of contemporary art works about size from artists represented by the gallery and beyond, and presented him with a slide show to convince him to curate the show. And we saw the Glenbow Museum do this where they had a series of celebrity-curated shows, one curated by David Suzuki for instance, so you take someone’s own issue as the starting point. And maybe the way to start that is through a flat process of looking at still images, and maybe the web is just showing us that process. At your talk you also mentioned the idea of the curator as ‘future filter feeder’ and I was wondering if you could elaborate on this. This is Anne-Marie Schleiner’s idea, which she published in an article in Intelligent Agent, an online magazine. If you only keep the part of gatekeeper out of all of the roles that a curator plays, then it’s a question of, in which types of institutions or organizations or systems is the curator is being a gatekeeper? If you take as the system the network, or the web, then that gatekeeping role is a bit like a filtering role because there’s a deluge of information to select from. The idea of being a filter feeder as opposed to just being a filter, is that there are platforms that are set up for people to contribute content to, and they need to filter the deluge of information into appropriate content. So then it moves from being gatekeeping to being more like editing. I think that’s what Anne-Marie Schleiner was really talking about in looking at online practice, and that was in 2002 so it’s already quite a long time ago that she came up with that idea. Listening to the discussions happening in the graphic design world right now for instance, or in the photography world, it’s really about setting up a platform or a website or a blog (to use a more generic term) and have people filtering information and reposting to these platforms that act as aggregators. 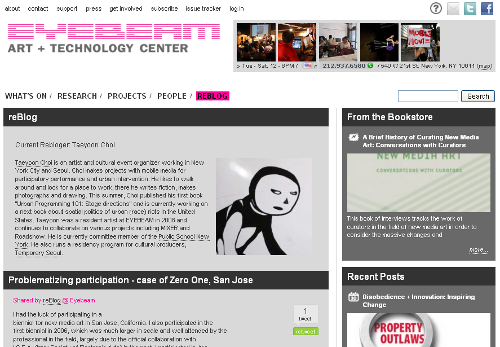 One of the first projects I had some experience of was Eyebeam’s reBlog. The reBlog was a piece of software developed in their lab that now seems completely commonplace which creates a blog out of other people’s blog postings. So every two weeks a different person takes on the role of reBlogger and their job is to parse through these feeds and decide what to repost to the front page. That parsing has a kind of curatorial remit to it because the feeds that are chosen for the Eyebeam reBlogger were chosen by previous Eyebeam reBloggers, so they’re not looking at the entirety of the web to start with, they’re already looking at an Eyebeam-selected list of feeds. Artists come into Eyebeam as residents or fellows and they’re asked to reBlog almost upon immediate arrival and they’re told that if they reBlog for two weeks now not only will it get them into the habit of reposting but they can also use it as a research period for their ideas, so the Eyebeam website takes on the personality of the person reBlogging. For me that was the first clear technological example of the idea of curator as filter feeder, it’s just about making your research public. And every platform, every filter, is going to have a different angle that you’re going to take on it and your role as a feeder of that filter is going to change depending upon the structural conditions of that platform. 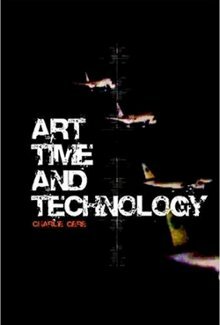 I think it’s interesting that Rethinking Curating makes a strong point that a good understanding of art history and also the history of technologies are both necessary to understanding these processes, and I was wondering if there are any resources you would recommend. One of the only people I know who does this well and who we at CRUMB chose as a research partner is Charlie Gere. 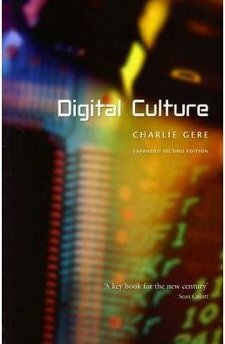 He’s written a book called Digital Culture, and another one called Art, Time, and Technology, and because he is an old fashioned historian at heart and his father was a curate, he’s a very good academic and he understands that you can’t talk about this kind of art without dealing with the history of systems. There are not very many people like Charlie. I wish there were more. I’m working with him, and with FACT on Re:wire, which will be the fourth international conference on the histories of media art, science and technology, although we’d like to rename it ‘histories of media, science and technology in art’ which seems more appropriate. At the last three editions of this conference – Re:fresh, Re:place and Re:live – historians of science and historians of technology weren’t sufficiently seduced to be there in conversation with historians of art, so what you end up with is endless talks about reel to reel tape and early film and punch card systems but you really want to have the laboratory life ideas and science communication ideas. What I’ll be working on for the next year is trying to identify the people who can address those crossovers. I would point to somebody like Sherry Turkle, I would point to people who are sociologists and anthropologists by training and who look at the impact of technology on life and on culture and understand art as an extension of that. In terms of how curators can become more familiar with the histories of technology I still draw a blank a little bit because the danger of suggesting any one text on the history of technology over another is that you prioritize the technology as tool and so you learn about the technology from the perspective of its use value, as opposed to learning about it from the perspective of its sociological impact, its cultural value. So I’d be more inclined to find the sociologist and the cultural theorists who understand technology’s role in culture rather than a really great historian of technology. This could be an ongoing debate, and something I would be interested to work more on. You have to almost go as far back as the Futurists; they understood the cultural impact of technology and they were grappling with the history of technological innovation. The danger is taking one without the other. So we should look at moments in history where there is an interesting synthesis that can inform our practice. Do you think it’s as important for it to be a cross disciplinary discussion for the technologists? Well I think technology historians or cultural analysts of technology today are aware of it and again I come back to this ambivalence I have about the graphic design world. For example Bruce Mau curated a show called Massive Change and what we saw in that show is the cultural impact of technology on graphic design, i.e. data visualization, databases, representation! It seems to me to be of as much interest to technology people as it is to art historians. If we’re going to see more things like that then I don’t see why technologists or people who are studying technology wouldn’t be interested in art. Is that related again to an inability to seduce people to new media art from the other side of the art world? It could be, and it also could be that we forget that curators are individuals with individual tastes, and so the inability to seduce the visual arts or contemporary art world towards new media art could equally be because some of us have prioritized the techy aspects of new media, and not the systems or the algorithmic aspects or those things that the visual art world was in to at the time. If we had prioritized the interesting network or the visualization or the potential for sharing, or some of these other things that new media art has taught us, then we might have had better luck, but it was just the way it went. In England somebody says to me every year, ‘why hasn’t there been a Cybernetic Serendipity 2?’ It will happen, one day. Maybe that comes back to the idea of redo-ing shows in a better way, but why are we more interested in Cybernetic Serendipity now than people were then? Or are you just going to do a CS2 because you feel like you should, because the art world should have paid attention then? I don’t want to be involved in the show if that’s the reason for it. Then it becomes a revisionist art history, you missed it the first time we’ll give you a second chance, it’s good for you! Why do you think there’s a resurgent interest in cybernetics and systems thinking? Oh just because it now applies to business models and everything else. It applies to the disappearance of bumblebees and the fall of Lehman Bros and all of that is tied to the ideas of systems and networks. It’s just entered the public consciousness in a different way now. 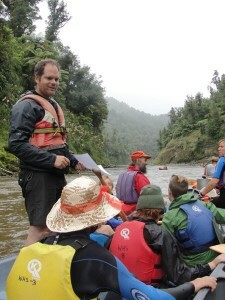 Slow Flow trip down the Whanganui River (picturing Julian Priest), photo by Trudy Lane. I was in New Zealand last year and went on a canoe trip down the Whanganui river (organized by the aforementioned artist, Julian Priest), and the point of the trip was to unplug, and go at the speed of the flow of the river, the speed of conversation. It was a trip sponsored by a media arts organization, and there were technologists and media artists on the trip carrying loads of waterproof gear. The whole point was to think about other ways to see the world. This idea of networked thinking came up because sitting in this canoe with all these people you become a network but we were also visiting sites where communities had tried to create new ways of living, like failed hippie communes and Maori communities who reclaimed their land from the government, and what I really learned on that trip was that this idea of network thinking can be incredibly local as well as global. You can try to create a network amongst a small group of people in a particular time and place and you might not be aware of another group that’s doing the same thing at the same time, and what we tend to think now is that you must know about each other because you’re all part of the same global network, but the fact is that the networks can become much more localized and isolated. So I don’t know why people are more interested in network thinking except that it’s impacting their lives differently and they’re recognizing that the global network is not going to save them – in fact it’s going to do them in. And that to go back to a local network is actually far more rewarding, on a very human social level. Maybe that was the lesson of being in New Zealand, witnessing local networks that had failed in an earlier time, and wondering – would they succeed today given what we know now about how global networks work? This entry was posted on Sunday, October 10th, 2010 at 3:46 pm	and is filed under Corina McDonald. You can follow any responses to this entry through the RSS 2.0 feed. You can leave a response, or trackback from your own site.